"A Future of Faith: The Path of Change in Politics and Society" by Pope Francis with Dominique Wolton. St. Martin's Press (New York, 2018). 304 pp., $29.99. "Open to God: Open to the World" by Pope Francis with Antonio Spadaro. Bloomsbury (London, 2018). 200 pp., $14.40. Two new collections of conversations with Pope Francis illuminate his vision for the church in the 21st century. "A Future of Faith: The Path of Change in Politics and Society" presents his dialogue with Dominique Wolton, a French reporter and sociologist. Their 12 conversations range across such compelling topics as globalization, immigration and poverty. Wolton adroitly raises timely issues for the pope to address. When he asks about the refugee crisis in January 2016 in Lesbos when Francis famously said, "We are all migrants, and we are all refugees," the pope elaborates: "Our theology is a theology of migrants. Because we all are since the call to Abraham, with all the migrations of the people of Israel, and Jesus himself was a refugee, an immigrant, and existentially, by virtue of our faith, we are migrants." Lack of work and war are the twin forces that create refugees, the pope adds. In the case of the first, we must identify and invest in new job sources. In the case of war, "people complain that migrants are coming to destroy us. But we're the ones sending them the weapons!" He explains that by "we," he means "the West" as well as "some non-Western countries (that) also sell weapons." Pope Francis has much more to say here about the church in the modern world. He cautions against "wanting to modernize without discernment" and also laments the "rigidity" of some younger priests. "They're afraid of the Gospel and prefer canon law. But that's a caricature, just a manner of speaking." He continues: "If you're a pastor it's about serving people. Not looking at yourself in the mirror. The true wealth is the weak little people, the poor, the sick, the ones right at the bottom, the ones who are morally weakened. ... That's where the wealth of the church lies: among the sinners." Pope Francis' well-known compassion and concern for the poor and marginalized are often apparent in these pages. Throughout the book he comes across as an intelligent, wise and humble leader whose humanity is unmistakable. "I am at peace with the Lord. I have many joys," he says. "When priests come to me for help for their problems, I feel the joy of someone who is given a child; it's also a joy to celebrate Mass." He adds that "the sense of humor is the thing, on the human level, that comes closest to divine grace." The book also includes excerpts from six of the pope's major speeches since he was elected pope in March 2013. These are well chosen to flesh out the dialogues. All in all, "A Future of Faith" is an inspiring introduction to the pope's mind and heart. 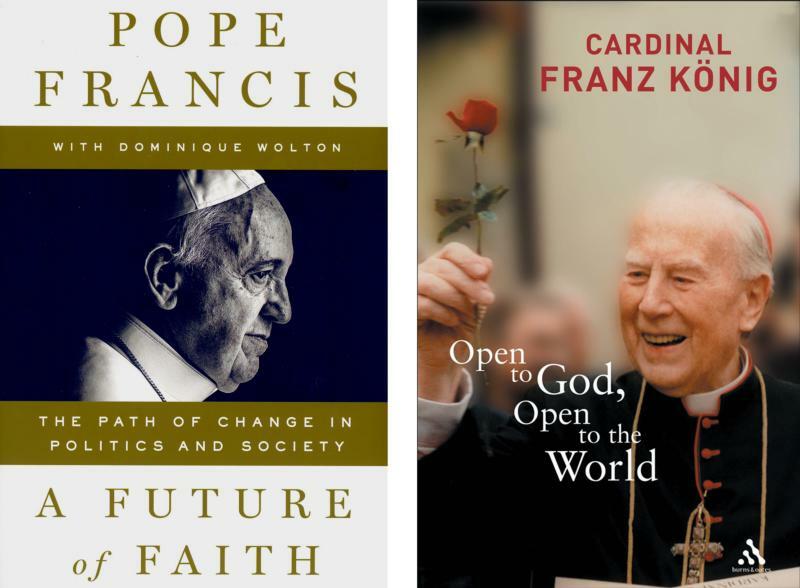 "Open to God: Open to the World" is similarly based on conversational dialogue between the pope and Father Antonio Spadaro, a Jesuit who provides a thoughtful interpretive perspective. He explains how the pope strives "to look people in the eye." The Holy Father's "message is able to touch people immediately, directly, intuitively," Father Spadaro writes. "His ability to communicate is rooted in pastoral experience, carried naturally to the creation of authentic relationships. His authority is never expressed in a rigid manner, like that of a marble statue; even its physicality is directed toward the interlocutor." Father Spadaro gives us a close-up view of the pope's heartfelt ecumenism, recounting his interview with the pontiff just before his October 2016 visit to Sweden to participate in the ecumenical celebration of the Lutheran Reformation's 500th anniversary. The pope noted the importance of theological dialogue, but also expressed his belief in the importance of joining with those of other (or no) faith in "common prayer and works of mercy, working together to help the sick, the poor, the imprisoned. Doing something together is a deep and effective form of dialogue," he told Father Spadaro. "Speaking, praying, working together: that is the path we must take." Similarly, Pope Francis' advice to a young person who asked how to convert an atheist friend was, "The last thing you must do is to say anything. Act! Live! Then, seeing your life, your witness, the other person will ask you why you live like that." The pope added his insight that "those who do not believe or do not seek God may not have experienced the restlessness that comes from bearing witness." And this "restlessness is difficult to find in affluence." One of the most interesting sections presents Francis' views on politics. In this highly polarized world, what is its proper role and value? The pope notes that what he calls "big politics … has been increasingly degraded into small politics." But true politics is "craftsmanship used to build the unity of peoples and the unity of a people with all the diversity that is within them." It is "one of the highest forms of charity" — and one that is helped by dialogue. This echoes what he told Wolton in "A Future of Faith" when asked his advice for those wishing to enter politics: "Do it to serve. Do it out of love. Don't do it out of personal interest, out of greed or a desire for power." "Open to God: Open to the World" also includes the pope's recent speeches in Myanmar, Peru and Chile. Among the book's personal insights is how the pope has found creative inspiration for his sermons in literary works such as Dostoevsky's "The Brothers Karamazov" and "Notes From Underground," as well as works of Argentinian and German literature. "Novels, literature can read the hearts of men, they help us to respond to desire, splendor and misery. It isn't theoretical. It helps you to preach, to know the heart." Roberts directs the journalism program at the University at Albany, SUNY, and has written/co-edited two books about Dorothy Day and the Catholic Worker.